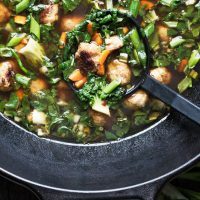 An easy and delicious soup, with flavourful meatballs, a lovely broth and lots of greens. Preheat oven to 400F (205C). Line a large, rimmed baking sheet with parchment paper or greased foil. Set aside. Prepare meatballs: Beat egg in a large bowl. Stir in panko, garlic, ginger, soy sauce and sesame oil. Add ground pork and stir to incorporate seasonings into pork. Shape meatballs using a rounded 1 tsp measuring spoon. Place on prepared baking sheet. Bake for 18-20 minutes, or until juices run clear and the meatballs are browned in spots. Remove from oven and set aside. *You can make ahead and refrigerate for up to 1 day or freeze for longer. Meanwhile, heat vegetable oil in a large pot over medium heat. Add sesame oil and carrots and saute for 5-7 minutes, or until carrots are softened. Add ginger and cook, stirring, for 1 minute. Add broth, water, soy sauce and chili garlic sauce. Bring to a boil over high heat, them reduce heat and simmer for 10-15 minutes, or until the carrots are tender. Add meatballs, rice vinegar and 1/2 of the green onions to soup and allow to cook until meatballs are heated through. Turn off heat under soup. Stir in bok choy until just wilted. Serve garnished with remaining green onion.